When selecting the proper pump for heat transfer systems, there are several factors to consider. The pump must accommodate for a system’s temperature, pressure, and fluid properties. If a pump is chosen incorrectly, it can result in inefficient system performance or even lead to pump malfunction, such as pump seal damage and leakage. Choosing the best pump for your application can be a daunting task, but knowing which types of pumps are suitable for certain situations can make the decision a lot easier. There are two main types of pumps used in high heat transfer systems. Positive displacement pumps displace liquid by creating a cavity between the moving components, into which fluid fills. The fluid is then forced out when the mechanism closes those gaps. Please note this article only refers to rotary positive displacement pumps. Reciprocating positive displacement pumps are not designed for use with heat transfer fluid. Centrifugal pumps use a rotating impeller, motor or turbine driven, to create kinetic energy, which increases the static fluid pressure. Fluid enters the pump through the impeller along its rotating axis, and discharges radially to the outlet. Magnetic driven pumps are a unique sealless option, in which integrated magnets drive each other to turn a canister-enclosed shaft. Magnetic pumps are similar to centrifugal pumps in that the driving magnets are also motor driven. Each type of pump has its advantages and disadvantages, which are discussed in further detail. One of the most important system design points to address is fluid viscosity. If this is properly considered, you can eliminate which pumps would not perform proficiently. Keep in mind that heat transfer fluid viscosity increases considerably at low temperatures. See table 1. A heat transfer fluid’s operating range is the temperature range between the pumpability point and the recommended maximum fluid operating temperature. The pumpability point is defined as the temperature where a fluid’s viscosity reaches 2000 centipoises. At this point, the fluid becomes too viscous for centrifugal pumps to maintain fluid flow. It is important to note that the pumpability of the fluid is usually only a factor at startup. Although heat transfer fluids technically can be used at temperatures close to their pumpability points, many fluids (especially petroleum-based fluids) lose much of their heat transfer efficiency if used close to their pumpability point. Centrifugal pumps operate best with low viscosity liquids, typically ranging up to 550 cP. In this range, centrifugal pumps are capable of handling essentially most heat transfer fluids on the market. However, since they operate at motor speed, pump efficiency and flow rate drop significantly as viscosity increases. This is due to increased frictional losses within the pump’s mechanism. Positive displacement pumps excel in this category. They can effectively operate in a wide range of viscosities, and even more exceptionally at high viscosities (some can operate up to 1,000,000 cP!) Highly viscous fluid fills up clearances within the pump cavities, consequently improving pump operation. 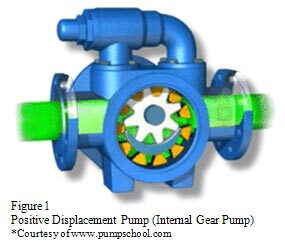 Conversely, positive displacement pumps, such as the internal gear pump shown in Figure 1, cannot dispel fluid in great quantities. Instead, positive displacement pumps are capable of delivering a constant, pulse-free flow through the system, independent of variations in system pressure. Centrifugal pumps can operate proficiently under certain pressures, but their efficiency significantly drops as system pressure increases. Most heat transfer systems are designed for operation under 50 psi, in which case, both centrifugal and positive displacement pumps can be used. Centrifugal pumps can be sized for head pressures up to 55 psi (125 ft.)The next considerable aspect of pump selection is system capacity. The main advantage of centrifugal pumps is their ability to transfer large volumes of liquid (up to 120,000 gallons per minute.) Processes can even be designed with several centrifugal pumps in parallel to maximize fluid discharge. HZ The vertical distance between the surface of the liquid in the supply tank and the centerline of the pump Can be positive when liquid level is above the centerline of the pump (called static head) Can be negative when liquid level is below the centerline of the pump (called suction lift.) Always be sure to use the lowest liquid level allowed in the tank. HF Friction losses in the suction piping Piping and fittings act as a restriction, working against liquid as it flows towards the pump inlet. HV Velocity head at the pump suction port Often not included as it’s normally quite small. HVP Absolute vapor pressure of the liquid at the pumping temperature Must be subtracted in the end to make sure that the inlet pressure stays above the vapor pressure. Remember, as temperature goes up, so does the vapor pressure. After calculating NPSH available (NPSHA), a pump with the appropriate NPSH required (NPSHR) can be chosen. NPSHA must be greater than NPSHR to avoid pump cavitation during system operation. Cavitation occurs when a fluid’s liquid pressure drops below its vapor pressure, causing the liquid to boil. Vapor bubbles produce pump noise and vibration, pitting damage to the impeller, and a sharp reduction in pump head and discharge. If a pump with a proper NPSH rating is selected, cavitation can be prevented. Once the correct pump is selected for an application, several shaft sealing options can be considered. One of the earliest forms of shaft seals is packing, which is made up of braided or formed rings compressed in the stuffing box of a pump. This type of sealing requires lubrication, either by the circulating system fluid, or externally. The main advantage of packing is that it rarely fails catastrophically. It is most effectively used in applications with thick, non-abrasive liquids. Elastomeric lip seals are also ideal for similar applications. While traditionally used for low pressure applications, technological advancements in newer seals allow for operation in high pressure systems (150-psi or greater) as well. The drawback to using a lip seal is the possibility of catastrophic failure, which could trigger more serious pump problems. Mechanical seals share this same disadvantage. Basically, mechanical seals consist of faces sliding against one another to form a seal. Similar to seal packing, mechanical seal faces are typically lubricated by the circulating fluid or other external methods. The most prominent benefit of mechanical seals is the wide variety of designs to accommodate a broad range of liquids, viscosities, pressures, and temperatures. Moreover, they are designed to be easily replaced or repaired. As mentioned earlier in this article, sealless magnetic driven pumps are becoming a popular option for hard-to-contain liquid applications. Although sealless pumps are a more costly alternative, they offer exceptional dependability and absolutely no leakage. In conclusion, there are several factors to consider when deciding which pump is most ideal for your heat transfer application. Although there is an extensive variety of pump options to choose from, knowing the capabilities of your system can help you narrow down the field.